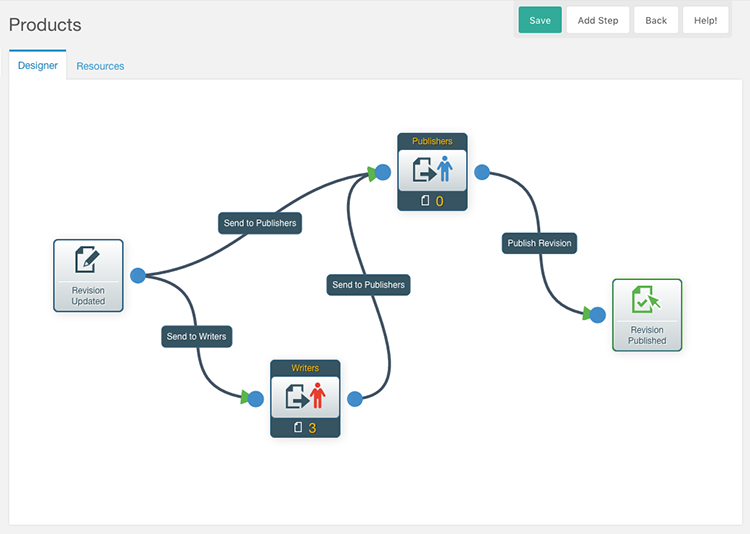 The designer is an intuitive drag-and-drop flow diagram that allows MODX administrators to describe the steps involved before content is published to the web. Each ruleset, which qualifies a resource for that particular process, uses the designer to visualise the relationship between publish states and user groups. In this example above, once a revision has been created or updated the author is presented with two options instead of MODX's default "Publish" button; "Send to Publishers" or "Send to Writers". This purpose of this scenario is dependent on the organisation. For many organisations there may be no requirement to offer more than one route. As this diagram illistrates, it is not possible for a resource to be published without passing through the "Publishers" group, even if the resource is sent to the "Writers" first. An audit trail detailing the steps that the revision has already been through is available for all users to view. It is also possible to pass a revision back down the workflow. In this screenshot we can see there are currently three revisions awaiting approval from the Writers. These revisions will present a Writer with the option to "Send to Publishers". Additional user groups can be added to the workflow at any time. It is also possible to adjust the workflow and add new routes. Existing routes are deleted by clicking the route and confirming. Once "Publishers" are happy to approve the content it will be published; replacing the revision's Master resource with the approved revision, including template variables.